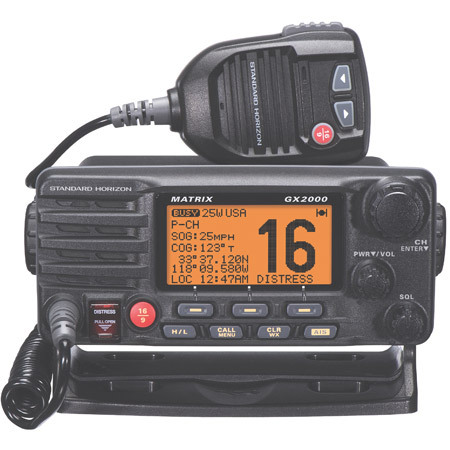 The GX2000 MATRIX is a 25W fixed-mount DSC VHF radio with AIS display capabilities. 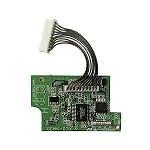 Just add an AIS transponder or GPS and AIS receiver for a versatile, low-power AIS display. With the optional RAM mic you can put VHF and AIS at hand in the cockpit or flybridge as well as in the nav station. International customers: Accepts MMSI and channel selection settings for all regions. Add an AIS receiver and simply press the dedicated AIS key to see AIS targets. Use as a low-power AIS display or integrate with chartplotter. Also includes: waypoint navigation, 30W loud hailer with listen back and RAM3+ second station capable. When combined with an AIS receiver or Class B transponder, the MATRIX displays AIS MMSI, Call Sign, Ship Name, BRG, DST, SOG and COG and will allow you to contact an AIS Ship directly using DSC. The display shows your vessel's position in relation to AIS targets. The the Closest Point of Approach (CPA) Alarm alerts you when an AIS ship may be approaching too close to your location. Add the CMP31 RAM3+ Speaker Microphone for complete second-station capabilities in your cockpit or flybridge. waypoint when connected to an external GPS. When activated, the DSC DISTRESS function transmits a digital MAYDAY including vessel identification, Latitude / Longitude and time (with GPS connected), to facilitate prompt response. Additional calls that can be made are Individual, All ship - Urgency and Safety, Group, Position report and position request calls. The MATRIX includes a 30W Loud Hailer with Fog signals; Bells and Whistles with listenback. 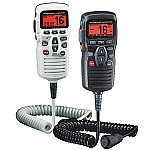 For added benefit, the last selected VHF channel can be heard when in the PA or Fog modes. It is easy to add remote access to the VHF radio (and AIS display and alarms*) to the cockpit of fly bridge. The MATRIX is RAM3+ remote mic capable to control all VHF, DSC and AIS* functions at a second station. The MATRIX AIS features Clear Voice Noise Reduction Technology eliminating unwanted background noises like engines and wind during transmission. This assures transmissions are crystal clear along with dedicated 16/9 key and channel selection. In addition the microphone includes a speaker for crystal clear reception of transmissions. Advanced receiver technology rejects the reception of unwanted signals from pagers and other unwanted VHF frequencies. In addition the MATRIX has an receiver attenuator to further reduce noise in busy harbors and marinas. Big, bold display There is no question about it. With a big, bold display there is no mistaking the information. The contrast and brightness can be adjusted for situations where the radio cannot be mounted directly in front of you. 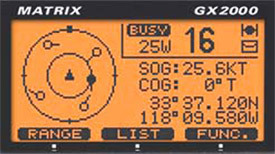 By connecting a GPS to the MATRIX position, date, and time are also displayed when interfaced with a GPS receiver. Simply connect the NMEA output wires from an AIS transponder to the GX2000 YELLOW and WHITE wires to have both AIS and GPS sentences sent to the GX2000. Because the MATRIX AIS is built better, i t is backed better. If your Standard Horizon MATRIX ever fails for any reason including water damage during normal use in the first three years, STANDARD HORIZON will repair or replace it free, without hassle or charges…period! If it fails thereafter in normal use it for the life time of the product it is covered by Standard Horizon’s Lifetime Flat Rate Service and Customer Loyalty Programs.